Ryley was a healthy, sporty 14 year old when he suddenly collapsed at home. He had sustained a severe brain injury. On transfer to Sunflowers Care he was unable to walk, talk, eat or do anything for himself. He had been in Addenbrooke’s Hospital in Cambridge for three months and specialists felt he would benefit from being in a quieter, more homely environment to progress further while waiting for a place in intensive rehabilitation. He was unable to return home at that time due to our house needing many adaptations for him. I valued the outstanding level of care that all the Sunflowers staff gave Ryley. He settled extremely well, loved everyone in the superb team and began to make steady progress. Karen Higgins and Lucy Andrews were amazing and super-efficient, setting up the therapies and equipment Ryley needed. They really did go above and beyond, giving support not only to Ryley but also to myself and family. They made many personal touches in the home. Ryley is an avid Liverpool fan so they put logos in his room and even in the lift. The staff created a typical teenage boy’s bedroom for him and let us put up posters and photos to make him feel more at home. Once he was settled, I felt confident leaving at weekends to spend some much-needed time with my other son, who was preparing to start secondary school. This made such a difference, as I had not been home for more than three months. I would not have felt able to leave Ryley alone in hospital. I was apprehensive, but the staff at Sunflowers made it easy, reassuring me I could phone at any time, day or night – we were even able to phone Ryley using a video app. Nothing was ever too much trouble. I stayed with Ryley most of the time and always felt comfortable around the team. We had many laughs with them all. 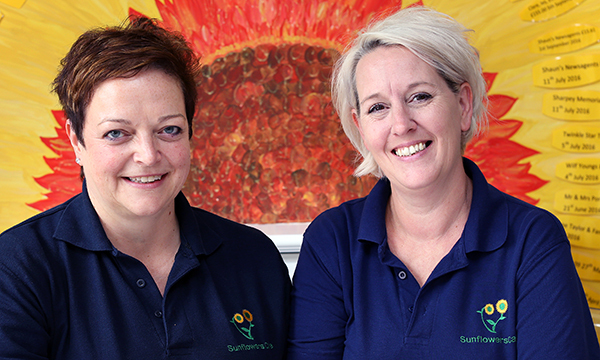 Sunflowers staff are like one big caring, loving family and they made us all feel part of it. I would highly recommend it to any family. Karen and Lucy are just what nurses should be like. They are hugely passionate about the work they do and their staff. Theirs is a really special place. Ryley's face says it all – whenever Sunflowers is mentioned his face lights up with a beaming smile.